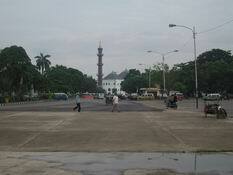 Pilgrimage Tourism Objects in Palembang !!! Obyek Wisata Ziarah dikota Palembang !!!! Klenteng Pulau Kemaro dengan Pagodanya: Ramai pada acara Cap Go Meh. Gereja Tertua di Sumatera Selatan: Gereja "Santa Maria" di Tanjung Sakti lahat: Dibangun 1832 berukuran 10x8 meter dapat menampung 100 jemaah. Bahan bangunan terbuat dari kayu Mahoni beratap seng. Bukit Siguntang is the name of a famous historical site in Palembang, seated at a hill about 25 m above sea level, the highest point in Palembang. From this site historians found Indonesia's oldest inscription containing importance information from. The Bukit Siguntang inscription, found at Bukit Siguntang site, dating back from 604 in the Saka era. From this inscription historians made hypothesis that the Sriwijaya Kingdom was centered here. The original Bukit Siguntang inscription is now in the collection of the National Museum in Jakarta. Bukit Siguntang is the site where Palembang's Buddhist community celebrates Waisak annually. Bukit Siguntang is also favorite destination for Malaysian tourists, due to its supposed historical links with Parameswara, who fled from Sriwijaya to Tumasik (Singapore) when the kingdom was attacked by Majapahit from Java in 1511. Prameswara then came to Malaka, married with the daughter of Malaccan dignitary founded the Malacca kingdom, and was it first king, setting the stage for the later establishment of Malaysia. The building of Sultan Mahmud Badaruddin II Museum was built during the reign of Sultan Mahmud Badaruddin I (1724-1758), called as the Kuto Lamo palace. This palace later became the residence of the Nederlands East Indies Commissioner in 1823. In the museum you will find replicas of inscriptions from the Sriwijaya sultanate era, Mattreya statue, Kerises, the family tree of the Palembang sultanate, coins from the era, the sultan's robes of office and many others interesting items, displayed attractively. Don't miss visit the museum !!!! 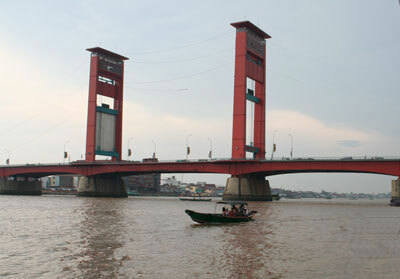 he famous Ampera Bridge of Palembang was built in 1962 during the administration of President Soekarno, the first president of Indonesia, using war reparation fund from the Japanese. The bridge stretching 1,777 meters across the Musi River, providing an enchanting view and romantic scenery at night, decorated with constantly changing colors of lights lining the shape of the bridge. Like San Fransiscans with its the Golden Gate, the Palembang people are truly very proud to have this the Ampera Bridge, using it as part of Palembang city logo. From sidewalk of the bridge, you can see the glimmering lights from the buildings of the Pasar 16 Ilir, the Sultan Mahmud Badaruddin II Museum and the Kuto Besak Fort, mightily standing in the riverbank of Musi River. Behind them are the old building of Mayor's Office, back to the colonial era, this building formerly was a water tower first operated in 1928. Also you can see the Masjid Agung (the Grand Mosque) with its maroon color tower and terraced roof. The mosque was built in 1738 during the reign of Sultan Mahmud Badaruddin I.
Pulau Kemaro !! 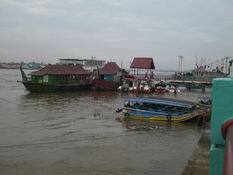 is a small island in the middle of the Musi river. In this island seated an old Chinese Klenteng (temple) with new towering Pagoda, which attracts millions of Chinese visitors each year for the Cap Go Meh celebration, 15 days to the Chinese New Year. So far no information on how old the Klenteng building is, or the graves within it.